This page will act as the official project car update page, or our garage diary, in the weeks to come. Our heads/cam budget buster, 1999 Z28, will be on center stage for you to read about and learn what stage one heads retaining the stock valves, mild cam, Mac headers, LS6 intake manifold and a few other modifications will provide on an LS1. We will have a detailed write up and overview at a later date but for now, this will have to do. Our goal is to slap together the heads/cam package for a low price without sacrificing top quality and to break the 400 rwhp barrier. Not everyone can go around dropping large amounts of cash into their cars and that includes us. Responsibilities are a part of life and having a budget comes with the situation. So sit back and watch my progress that may help you decided on a winning combination that suites both your needs and power requirements. Received LS1 Edit after four weeks of waiting. I have deleted the A.I.R. and EGR diagnostic trouble codes and adjusted my idle. The thorttle body hole was enlarged a hair to help bring the IAC counts down in the 50 range. I am currently trying to figure out what "tuning" is and what is the best way to go about it. Received ASP tensioner pulley from Thunder Racing. This pulley has higher edges on it to keep the belt from walking off. I had already replaced my older tensioner arm with a new one but the new one didn't work with the ASP pulley so I had to go back to the old tensioner arm with the ASP pulley. I am going to try a 6.0 liter tensioner setup on my car because I believe that my tensioner was bad. This would be a cheaper solution for those with my problem and there are a lot of us out there. Dyno'd the car with 800 miles on the heads/cam/header package. I picked up 80 rear wheel horse power! Great googly moogly!! Check out the new "after heads/cam" section I have put up. Installed TEA heads/cam package. A big thanks to my friend Darryl for letting me use his living room for sleep, his driveway for the install and his hands for some help! The car runs incredible! I have only encountered one problem since the install and that was finding my drive belt hanging off the idler tensioner and power steering pump by two ribs. I will be typing up an install summary of recommendations, advice and some stories from my install to help you. I won't be doing an install document on this swap for several reasons. This is an easy swap to do if you allow yourself enough time and patience. I can say right now I highly recommend 6 point sockets from Snap On or equivalent for the head bolts, rocker arm bolts and the crank pulley bolt. This will be included in my install summary. ARE blueprinted oil pump arrived. Whooo! We cut it close! Order yours early!! Received my chromemoly pushrods from Thunder Racing. My oil pump is the only major part left that I lack. Ordered a set of comp cams chromemoly pushrods stock length (7.400") from Thunder Racing. Received my cam in the mail today from Total Engine Airflow. I lack my install kit (gaskets and such) and I will be set. Ordered a blueprinted oil pump from ARE just to make sure I don't have an oil pump that poops out. Installed the MAC mid-length headers and off road y-pipe. I noticed a definite seat of the pants improvement in acceleration. I still have no muffler on the car and the loudness increased a lot but I still think it is ok to drive around the way it is. However, in order to protect everyone else's ears around me I think I might have a small high flow muffler with a turn down put on in the back where the stock muffler was present at one time. I would like to thank Phil Watson for lending a helping hand on the install. Called Thunder Racing and ordered two O2 simm's for my soon to be deleted catalytic converters. 63.7 cc combustion chambers on 2001 LS1 Cylinder heads which gives a 10.5:1 staic compression ratio. I am not sure what everyone goes by. I think the SAE leaves something to be desired but that is just my opinion so I posted both because I know some people like the SAE numbers better. Weather wasn’t all great either but it seems we went from winter to summer around here. I base lined 310/325 in Knoxville with HPP3, whisper lid and K&N air filter. 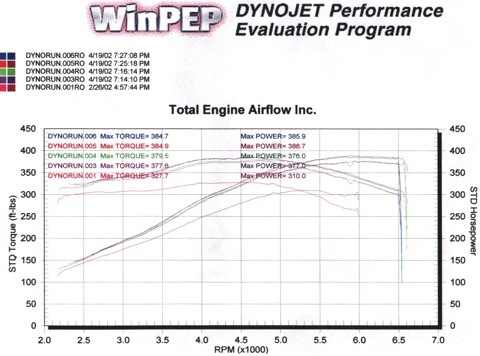 TEA’s dyno had me lower than that by 10 hp/6 TQ after I added the LS6 intake manifold and cutout. I find it hard to believe I took a step backwards. This leads me to believe their dyno is one of those that measures a little on the low side. To see if I am correct, I am going to bust down to Knoxville one day and get a run in on their dyno before I do any other modifications. Track testing starts this Friday night (April 26, 2002) on street tires. Then the following weeks I will move up in traction (nitto’s after that, etc…). A few notes about the heads. They are 2001 LS1 heads as stated above and were CNC ported IN HOUSE at Total Engine Airflow. So the results should be very repeatable. They retained the exact factory valves they had in them when I received them from Shaun (valvegod). I have 987 Comp Cam springs and 7.40 chromemoly pushrods. I am also running the ARE oil pump (which I have seen some oil usage with but not sure if the pump is the main reason for this). Click on any of the dyno graphs to enlarge them. This graph shows my best of four pulls on April 19, 2002 (after heads/cam) through an open cutout. This is the standard graph and is not corrected. As mentioned above, I think the SAE stuff is for the birds but I list both because some people are diehard SAE people. 381 rwhp/378 rwtq SAE corrected horse powerThis graph shows my best of four pulls on April 19, 2002 (after heads/cam) through an open cutout. Same exact pull as above but the numbers are corrected. All four pulls from April 19, 2002This graph shows all four pulls on April 19, 2002. Pulls three and four are through the one-chamber flowmaster muffler. Pulls four and five are through an open Zed style cutout. I am guessing that my exhaust is still restrictive since I am using the stock intermediate pipe, where the MAC off road y-pipe meets intermediate pipe necks down quite a bit and the header flanges to off road y-pipe chokes down quite a bit as well. Back pressure testing will be in the near future. 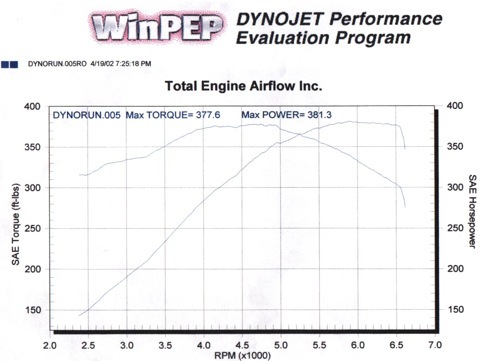 This graph shows my best pull compared against two of the best pulls for a Morgan Motorsports Stage 2 car that was dyno'd one month earlier. The MMS package had longtube headers, computer tuning, stage 2 heads, MMS cam and a few other goodies. Remember, my car has MAC mid-length headers. :-) This graph also shows how conservative the TEA dyno is. Pay close attention between 2000 and 5000 rpms. My car really out shined the MMS car. This heads were purchased around February - March 2002 and were flowed on the same bench as my TEA heads. Once you compare these flow numbers to my heads and view the dyno graphs, it becomes very clear why "peak" numbers are not the tell-tell sign to a good set of heads. There is a lot more to just hogging something out to get good flow numbers. Remember that my heads have the crappy stock valves in them which do not flow as well as an aftermarket valve. Compare the the MMS Stage 2 heads with bigger aftermarket valves to my Stage 1 TEA heads with stock valves. If this doesn't convince people to shop around a lot more for cylinder head purchases, I don't know what would. You can see that my intake numbers stay witht he MMS heads until 0.400" lift. At that point the stock intake valve can't keep up. However, the stock exhaust valves are not really that bad. I put the hurt on the MMS heads until 0.500" lift. Ouch! My car and my pocket book are both happy that I went with TEA. :-) TEA really are the mid-lift flow experts. Pre heads/cam form Our 1999 Z28 (6 speed) featured the following performance modifications before heads/cam: LS6 Intake manifold, Hypertech Power Programmer 3, !muffler, Whisper air box lid, Fast Toys Ram Air (doesn't help any on the dyno), 3.42 stock gears, factory replacement clutch with McLeod adjustable master cylinder, 160 t-stat. 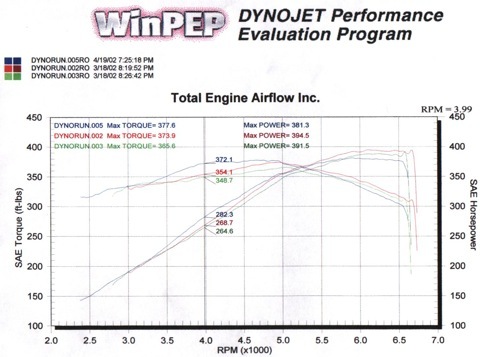 Dyno'd the car at Total Engine Air Flow on February 26, 2002: 310 rear wheel horse power and 327.7 rear wheel torque. Stage one heads Picked up my stage one heads from Total Engine Air Flow on February 2, 2002. 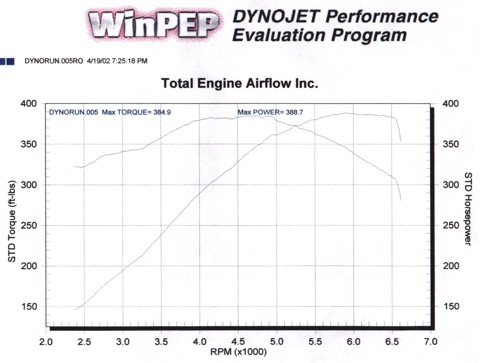 Below in Table 1, the flow graph features the the pre and post intake results along with the pre and post exhaust results. These heads retain the stock intake and exhaust valves. Aftermarket intake valves would greatly increase the flow but then I couldn't call my car a budget buster if I had purchased some big name valves. On the exhaust side, the results were far better than I could imagine on stock exhaust valves. They flow spectacular and I am very happy with the results. The heads were also milled 0.030" (30 thousandths of an inch) and were CNC ported at Total Engine Airflow in Bowling Green, KY. This resulted in 63.7 cc combustion chambers making 10.53:1 static compression. This is less than most competing aftermarket heads. This will result in an approximate 10-15 horsepower less for me since I didn't go with higher compression. That is just fine because I want to be able to run on pump gas and have no problems what-so-ever. * There was a leak (bad connection) on the flow bench when they were flowed. I tried to adjust the numbers after the fact because I didn’t notice the mistake until the heads were already ported. Adjusting down the flow according to the lower lift flow just didn't work as you can see. I guess as flow increases so does the effect the leak has on them at higher lift flow. This had to cause the unusual high flow for the stock exhaust port. I know the ported intake and exhaust were flowed correctly and the pre intake matches right on with documented stock intake flow. The right/hand column numbers were taken from the September 2000 issue of GM High-Tech Performance, Page 31. Are under the curve increase (ported over stock) Everyone talks about increasing the area under the curve so I decided to figure it out. The stock exhaust area under the curve was figured using the GMHTP numbers listed in Table 1 above. Table 2 list the areas before and after. The area's were figured up to 0.600" valve lift. If you have a set of flow numbers on a set of heads and you would like the area under the curve calculated and wouldn't mind the numbers being posted on this website for comparison purposes, please shoot us an email. Cost Sheet Here are the prices on all the parts and supplies that I had to purchase for this heads/cam/header install. These prices do not include shipping and handling or sales tax. Some prices are incomplete but will be filled in when I get time to look up the receipts. There are three sections including parts, supplies and tools. This way you can have some way of looking at each section individually.